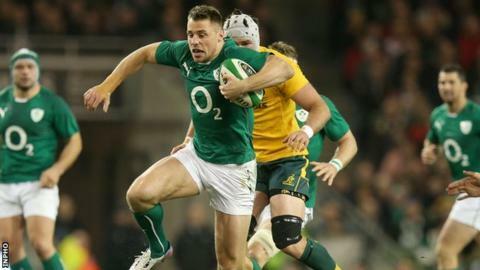 BBC Sport NI analyst Ryan Constable expects a high-quality contest between Ireland and Australia in Dublin, with plenty at stake for both sides. Having already seen off South Africa in convincing fashion, the prospect of securing another southern hemisphere scalp will provide ample motivation for Joe Schmidt's charges, who have now leapfrogged Saturday's opponents to move up to third in the official IRB rankings. Meanwhile the Wallabies will be keen to avoid a second successive defeat, having followed up a 33-28 win over Wales with a 29-26 reverse at the hands of France in Paris last weekend. "It promises to be an intriguing clash - if we get the quality of rugby we expect, it should be one of the best games of the autumn international series," said Constable. "A second win over one of the top-ranked teams in world rugby would give the Irish huge confidence going into World Cup year, while new Australia coach Michael Cheika is still trying to find out his best team after taking over from Ewen McKenzie last month." The former Ulster centre admits Ireland's win over the Springboks came as a surprise, but bore testament to the gameplan masterminded by Schmidt and his coaching team and executed by a supposedly under-strength side. "That match demonstrated how determined the Irish players were to implement their gameplan to beat South Africa - it wasn't a perfect performance but they were so well organised and committed to the cause," he added. "Previously I would have said that for Ireland to beat one of the top three southern hemisphere nations they needed to play at their absolute peak, with their opponents having an off-day, but that is no longer the case. "The performance against the South Africans was complete defensively but there were a number of set-piece issues to be addressed and I'm sure they'll have had a thorough review and put a lot of focus on that. "They have a very settled structure and Joe has now been there long enough to implement his philosophies and strategies. "He has a team that is still improving but the squad is very well prepared and the players have fully bought into the gameplan. "Against Australia they will want to use the set piece to gain possession and control the game so that they can play their patterns in the right areas of the pitch. Their kick and chase tactics, which have been improving, will also be vitally important." Constable, who earned his only cap for the Wallabies as a replacement against Ireland in Sydney in June 1994, says his native country's recent fortunes are in stark contrast to that of his adopted home. "Australia are in a lot of turmoil - they don't have the same certainty about their team and while Ireland will go into the game with a lot of confidence in their team ethic, their visitors have a lot of quality individuals, but their systems are perhaps not well enough embedded yet," he said. "The Aussies will look to implement a high tempo game as their strength is an exciting, unpredictable back line with an ability to light things up. "Their match against France was a very entertaining one but they are vulnerable at the scrum - it's not a dominant aspect of their game. "Michael Cheika has come in as coach and he's very highly regarded, having won the Heineken Cup with Leinster and the Super 12 with the Waratahs. "But he has no magical cure - the team is evolving and implementing a new philosophy takes time - there will be system errors and they aren't the finished article defensively, it'll take time to get everyone on the same page." Constable adds that in full-back Israel Folau, the Australians have "an exceptional athlete and rugby player who has a special ability to create space and score tries". "Kurtley Beale has returned to the squad too, having served his ban for off-the-field issues, and I regard that as a positive, rather than a distraction," he said. "There is no doubting his ability as a rugby player and now he is available for selection, he brings something extra to the equation. He's one of a number of outstanding individuals who will have a key role to play moving forward. "Cheika will of course have plenty of insight into individual Irish players from his successful tenure at Leinster and he'll want his team to come to Dublin and win on his return to the Irish capital. "Given his record at club level, he was the logical choice for the job and he has a huge amount of respect in the game. "He doesn't force a culture on the players or impose regulations on them, he leaves that up to the senior players to deal with, and that goes down well."